The 1986 World Champion Missouri Fox Trotter is Madam Sensation; owned by Spencer (Pop) Jenkins (fourth from right), Sedalia, Mo., and ridden to victory Saturday night by Geno Middleton, Nixa, Mo. Presenting the Charlotte Dampier Memorial Trophy to Jenkins is Dale Esther, president of the Missouri Fox Trotting Horse Breed Association. Madam Sensation, a beautiful sorrel mare owned by Spencer (Pop) Jenkins, Sedalia, Mo., is the new World Grand Champion Missouri Fox Trotter. Madam Sensation, shown in the 1986 Show and Celebration by Geno Middleton of Nixa, Mo., qualified for the grand champion stake class by taking first place in Class 39 on Thursday night, then held the prize winning form for the stake class on Saturday night. The winner’s circle is quite a common place for Madam Sensation because she was also there as the Grand Champion 4-Year­ Old in the 1985 Celebration, and was 3- Year-Old Mare winner in 1984, and 2-Year­ Old Mare winner in 1983. Reserve Grand Champion of the 1986 Show and Celebration is Missouri Missy C., owned by Bill and Martha Kimball, Owasso, Okla., and ridden by Mark Holifield of Owasso, Okla. Missy C., raised at Ava, Mo. by her former owners, Don and Carol Cunningham, is also familiar with the garland., having won championships as a foal in 1981, as a 2-Year-Old in 1983, and as a 3-Year Old in 1984. 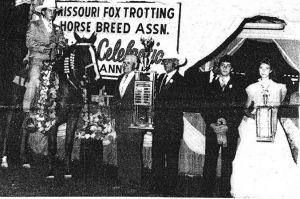 Dale Esther, president of the Missouri Fox Trotting Horse Breed Association, had predicted that the 1986 Show and Celebration would be the biggest ever, and he was certainly correct. Attendance for the Saturday night show was estimated at 4,000 by association officials, based on tickets sold, and the number of entries was well above the number shown in previous shows. The 28th Annual Show and Celebration recorded a total of 815 entries, up from the previous years. Practically every state in the Union was represented at the 1986 Celebration, with at least one family from Canada parked in the trailer section. Thirteen state flags were presented in the opening ceremony of Saturday night’s show, but many states, including Alaska, were represented but did not fly their flags. Grand Champion 4.-Yar-Old Fox Trotter is Rex’s Golden Touch, owned by Mary Martin, Eldon, Mo., and shown by Steve Dampier, Springfield, Mo. Steve Dampier rode Fox Trotters to world championships Saturday night in three different age classes. Reserve 4-Year- Old Champion is Knight Rider, owned and shown by Jim Huffman, Strafford, Mo., formerly of Ava, Mo. Missouri Red Wing, owned by Guy C. Hare, Rogersville, Mo., and shown by Dampier, is the Grand Champion 3-Year- Old Reserve Champion 3-Year-Old is Box Car Willie, owned by Cleo Wilson, Marshfield, Mo., and shown by Curtice Williams, Marshfield, Mo. The 1986 Grand Champion 2-Year-Old Missouri Fox Trotter is Traveler’s Midnight Lady, owned by Sonia and Ray Pendergrass, Rolla, Mo., and shown by Dampier. Reserve Champion is Southern Jazz, owned by Curtice Williams, Marshfield, Mo., and Bobbie Helsel, Amite, La., and shown by Williams. With the amateur classes becoming more popular each year, a Grand Champion Stake Class has been added for those riders who do not train horses professionally. Winner of the Amateur Stake Class this year is Daniel’s Blue Day owned and shown by Roger K. Miller, Raytown, Mo. Reserve Champion is Missouri’s Melody E., owned and shown by Larry Kilroy, Leawood, Kansas. The World Grand Champion Model Class winner this year is Dark Beam, owned and shown by Don Freeman, of Mansfield. Reserve Champion is Perfection’s Renegade Lad, owned and shown by Gary Thomlinson, Mtn. View, Mo. In addition to the World Grand Champion Stake Classes that were held on Saturday night, several other awards were presented. The Youth Equitation Award went to Sara Sterkey, Glasgow , Mo. , with equal Reserve Champion Awards going to Casey Huffman, Strafford , Mo. ; Lorelie Young, Marshfield , Mo. ; David Love, St. Louis, Mo. ; and Sherri Daniel, Rogersville, Mo. Florine Barham, Bolivar, Mo. heads up a youth program for the youngsters in the MFTHBA, and the top awards were presented Saturday night to Sara Hoffstetter and Kim Hale, both of Bolivar, Mo. Association President Dale Esther, presented jackets to the two winners. This youth program takes youngsters through five levels of awards, with the top awards presented at the Celebration. Esther also presented the Humanitarian Award on Saturday night, and this year’s winner is Eugene White, Ash Grove, Mo., a longtime supporter of the Association and a former MFTHBA board member.